This example shows how to debug HDL Coder generated IP Core using HDL Verifier's FPGA Data Capture feature. Follow the "Set up Zynq hardware and tools" section in HDL Coder example Getting Started with HW/SW Codesign Workflow for Xilinx Zynq Platform (HDL Coder) to setup ZC702 hardware. When you debug the generated IP Core from HDL Coder, it is useful to monitor the IP Core internal signals when it is running on the real hardware. This example shows how to use the HDL Verifier's FPGA Data Capture to capture such signals into MATLAB for debugging analysis. The subsystem led_counter is the hardware subsystem targeting the FPGA fabric. Inside this subsystem, we marked several internal signals as test points. 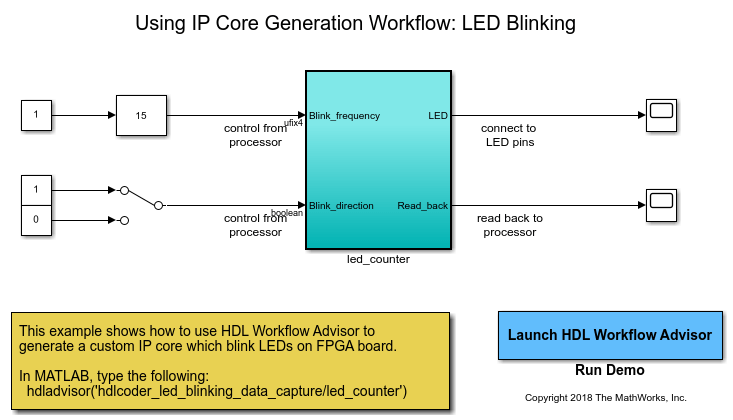 HDL Coder will route those internal signals out of the DUT and into the IP Core wrapper so that the signals can be connected to the FPGA Data Capture HDL IP. 1. In step 1.1., select IP Core Generation in the Target workflow. For "Target Platform", select "Xilinx Zynq ZC702 evaluation kit"
2. In step 3.1.3, check the "Enable HDL DUT port generation for test points"
3. In Step 1.3, select "FPGA Data Capture - JTAG" interface for blinkfrequency, blinkdirection, led_output, and count ports. 4. 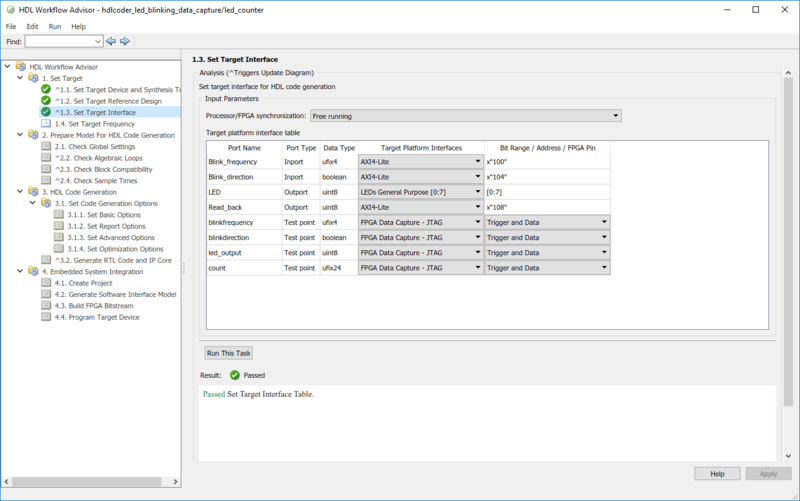 Run through the remaining workflow steps to generate HDL IP, and program the target device. Now FPGA fabric has been programmed and running, the next step is to capture the data from the Zynq board. First, locate the FPGA Data Capture launch script. In this example, the script is in your HDL code generation directory: hdl_prj/ip_core/led_count_ip_v1_0/fpga_data_capture/launchDataCaptureApp.m. You can also locate this script in the code generation report. Next, run this script in MATLAB. You will need to add the directory where this script is located to the MATLAB path or change your current folder. After executing this script, the FPGA Data Capture App is launched. 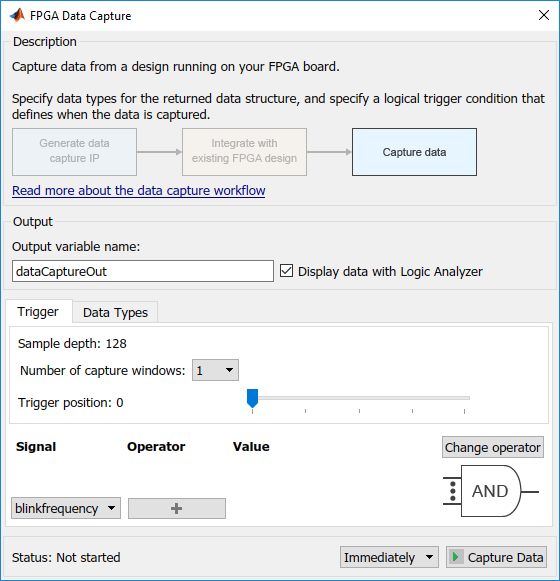 You can click the "Capture Data" button to capture data from FPGA without setting up any triggers. Alternatively, you can setup a trigger condition where led_counter==0, and trigger position of 32. Then click "Capture Data" button again.